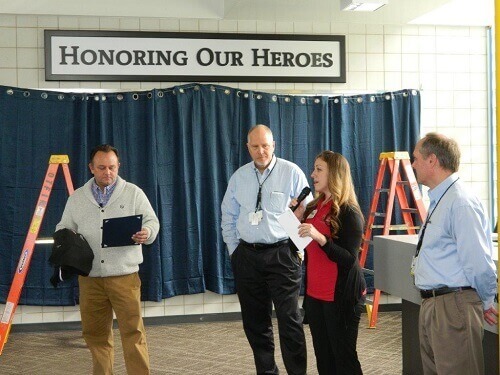 On Veteran’s Day, Site Vice President George Gellrich unveiled our new Wall of Honor, which is a tribute to all Veterans who have served both our Country and Calvert Cliffs. During the unveiling ceremony, George spoke about the importance of diversity and inclusion at Calvert Cliffs. “To me, the wall speaks volumes about our commitment not only to Veterans, but to diversity and inclusion. Our goal is to attract and develop top talent of all backgrounds, and encourage a culture of inclusion, diversity of thought, and innovation,” Gellrich said. The wall was designed by a local artist and Veteran, Terry Quinn of Solomon’s Gallery. Terry joined George during the unveiling to thank Calvert for the opportunity to be part of such a historic moment for the Station. The artwork comprising the left-hand portion of the wall is a replica of Terry’s picture of a local barn on Route 4 that has had a painting of the American flag on its side for many, many years. Most employees recognize the barn as a local landmark. The right-hand side of the installation includes the names and service branches of all employees and retirees who answered the call for names earlier this year. During the ceremony, George explained that we hope to grow the wall with the names of many more Veterans, as the Station continues a long-standing practice of hiring Veterans. As one final surprise, George announced that Calvert Cliffs would be donating $1,000 to the Charlotte Hall Veteran’s Home in Terry’s name and in honor of all Calvert Cliffs Veterans. 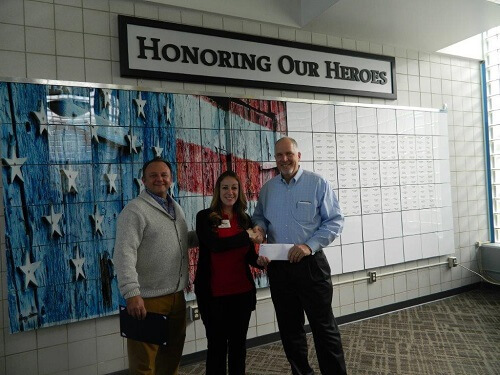 Melissa Canada of Charlotte Hall Veteran’s Home accepted the donation during the ceremony. She spoke about how the money would support personal care items and activities for the senior Veterans at the Home. After the ceremony, all Veterans onsite were invited to take part in a luncheon. Is there a way that we can see the names on the board…I am a retiree of CCNPP. I will check with the PIO but I do believe it is located where persons visiting Calvert Cliffs can see the wall.